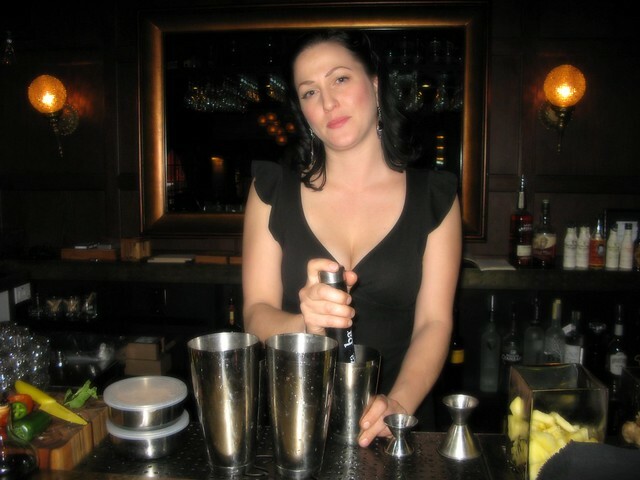 Enjoy bartender Naomi Schimek's Nantucket Sound summer cocktail. Save on your electricity bill this summer by spending your Wednesday nights at The Spare Room, Hollywood Roosevelt’s swank cocktail bar/bowling alley. Every Wednesday from 6 to 9pm, have them foot the A/C bill while you spend your savings on food, drink and fun deals. Nosh on $5 mini lobster rolls while tossing back $3 beer between sets — bowling is available for half price! Normally it’s $100 an hour (six players max). There’s also a specialty summer cocktail, Nantucket Sound ($7), that SR bartender Naomi Schimek created for the event. If you’re the DIY type, you can try it at home, if you have lemon balm leaves, cantaloupe juice and the like already in your fridge, that is. 1) Shake ingredients together with ice and strain over a scoop of spiced ginger sorbet. 2) Garnish with a candied lemon balm leaf. But I wanna play! The weekly summer event kicks off tonight!